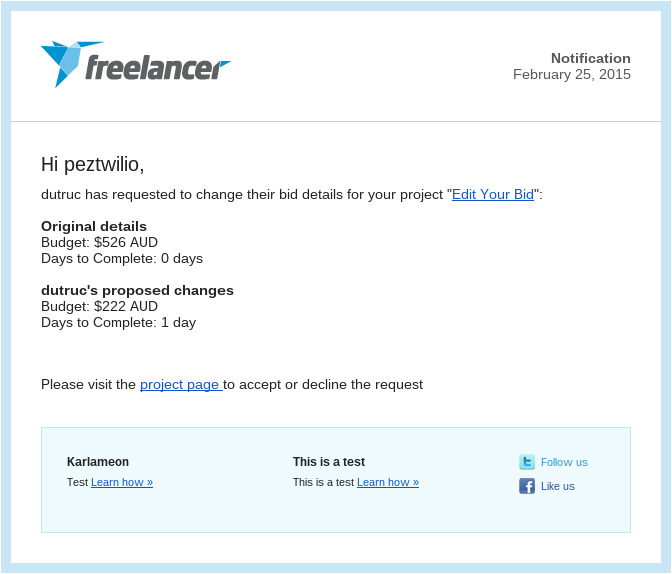 Freelancers can now change their bids after they accepted a fixed project. That’s right! They can edit the bid amount and time frame until they come to a final agreement with their employers. What’s in it for freelancers and employers? With this new feature, freelancers can make the request to edit their bids directly from the employer, skipping the review stage done with customer support. Freelancers just need to submit a form, and employers can accept or reject the proposed changes. Freelancers can change the bid amount regardless of the project budget. If the new bid amount is lower than the original bid, there will be no fee adjustment. However, if the new amount is greater than the previous bid, the fees charged on acceptance will be adjusted to match the new value of the bid. Modified fees are dependent on the new bid amount and the freelancer and employer memberships. Below is an illustration of fee adjustments if the new bid amount is higher than the previous bid. In the given example, the freelancer and employer have Basic Membership with 10% and 3% project fees respectively. They will be notified of the new fees before the employer accepts or rejects the modification. Read on to know how this new feature works for freelancers and employers. The freelancer can click “Change My Bid” on the upper right hand corner of the page. This will toggle the edit bid form. Enter the new bid amount and time frame, then click “Submit Request”. 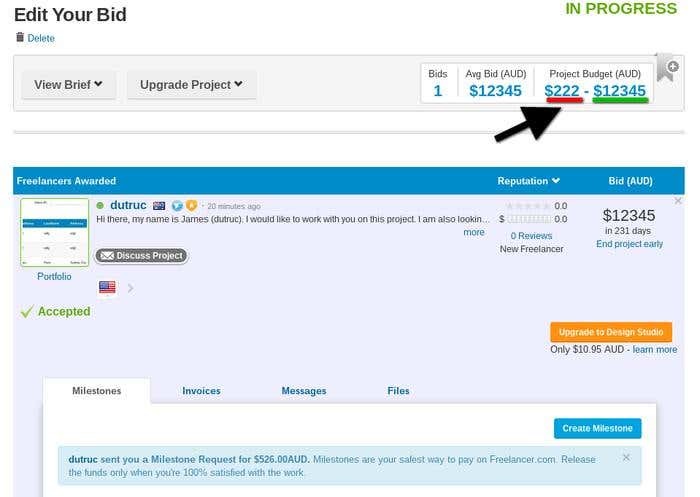 If the new bid amount is higher than the previous one, the freelancer will receive the confirmation modal displaying the additional fee that will be charged upon approval of request. 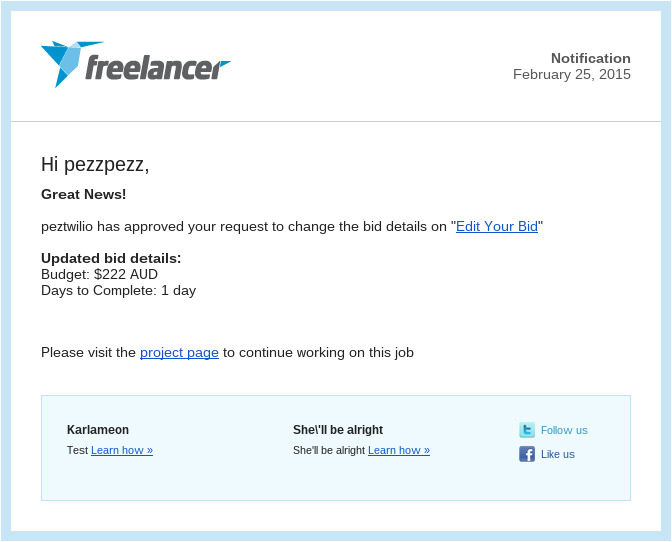 If the new amount is less than the original bid, the freelancer will receive this confirmation modal. Once submitted, the employer will get the request notification and the freelancer will just wait for the former’s response. Note that before submitting a request to edit the bid, it’s important that the freelancer notify the employer first. Use the chatbox for faster communication. When a freelancer submits an edit bid request, the employer will see this form on the project view page. If the new bid amount is greater than the previous one, this confirmation modal reflecting the additional fee will be displayed upon acceptance of the freelancer’s request. 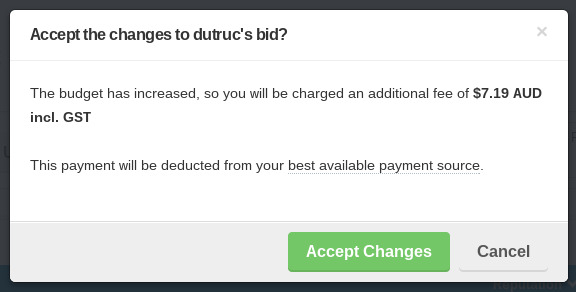 If the new bid amount is lower than the old one, there won’t be a fee adjustment. The employer will see this confirmation modal. When the employer declines the request, this confirmation will show. Once the entire process is completed, the revised bid details are displayed on the project view page. Additional transaction fees can be monitored in the financial dashboard. They will be marked as ‘Additional Project Fees’. Editing bids is that quick and easy! Right now, this feature works for fixed projects only. We’ll keep you posted once this feature is made available for hourly projects. Tell us what you think of this new feature. Feel free to join the conversation in the comment box below. Looking for work? We’ve got thousands of projects on the list! Bid on a project now. Got some work to be done? Post a project and tap our growing list of world-class freelancers.